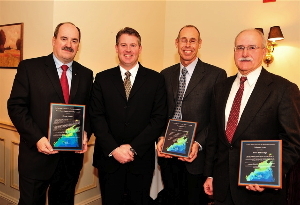 Nine individuals and organizations were presented with Gulf of Maine Council on the Marine Environment Visionary awards at an annual ceremony held December 9, 2009 in Portsmouth, NH. Gulf of Maine Visionary Awards are made to individuals or organizations within each of the five Gulf of Maine jurisdictions of Massachusetts, New Hampshire, Maine, New Brunswick, and Nova Scotia to recognize innovation, creativity, and commitment to marine protection by those making a difference to the health of the Gulf of Maine. In 2009, a new award was presented that celebrates sustainable maritime activities. These awards were made from wood certified by the Forest Stewardship Council using environmentally responsible finishes including walnut oil, natural pigments, and beeswax. The awards are presented in alphabetical order by jurisdiction. The following organizations generously sponsored the awards ceremony: naturesource communications, an environmental consulting firm in Boscawen, NH; Normandeau Associates, environmental consultants based on the east and west coasts; VHB/Vanasse, Hangen Brustlin, Inc, an east coast environmental consulting firm based in Watertown, Mass. and Woodard & Curran, an engineering, science and operations company with offices in various east coast locations. 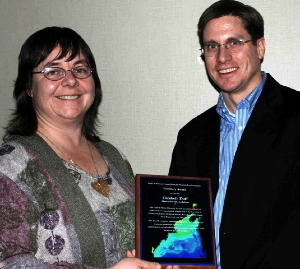 Kathleen Leyden, director of the Maine Coastal Program presented a visionary award to Paul Dest, director of the Wells National Estuarine Research Reserve in Wells, Maine for sustained excellence in science, communication, partnerships, education, and stewardship of the Gulf of Maine coastal ecosystems. The Wells National Estuarine Research Reserve has fostered an environment of coastal understanding and awareness through numerous programs that have been effective in training many stakeholders in the region and enlightening marine professionals as the scientific dynamics of estuarine ecosystems. Bruce Carlisle, Massachusetts Office of Coastal Zone Management presented an award to Liz Duff, an Education Coordinator with the Massachusetts Audubon, based in the North Shore area. Her expertise, and passion, for more than 12 years, centered on engaging schoolchildren in hands-on conservation science by involving them in salt marsh protection and restoration activities through a highly acclaimed educational program she created in 1996—the Salt Marsh Science program. Carlisle also presented an award to Jan Smith, who was director of the Massachusetts Bays Program from 1996 to 2009. During his tenure, he strengthened the region’s effort in understanding coastal wetlands dynamics, stormwater pollution, and invasive species emergence and distributions. As a leader of the Mass Bays Program, Smith was known for fostering individual strengths in defining initiatives within the Massachusetts Bays region as well as when engaging individuals involved in GOM initiatives. 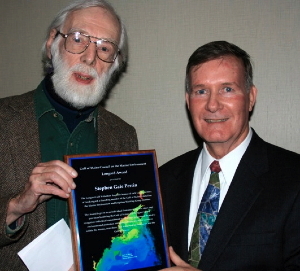 Smith was also one of the original participants in the development of indicators for understanding the Gulf of Maine ecological conditions. The Atlantic Reference Center of Fredericton, New Brunswick, was announced at the annual meeting as a Visionary award recipient, but actually presented with its award on December 15 in Fredericton. A research museum for Canadian marine life and a centre for biodiversity information and applied environmental research, the Atlantic Reference Center archives and identifies species that inhabit the Bay of Fundy and the Gulf of Maine. The Center provides a critical service for the preservation and understanding of marine flora and fauna in these waters. The Huntsman Marine Science Center and Fisheries and Oceans Canada, created the ARC in 1984 to archive samples of Canadian Atlantic marine life collected by research surveys as a source of taxonomic information. The Atlantic Reference Center services include sample processing and specimen identification, information, advice and research for governments, universities, museums, private institutions, industry, and the public. In addition, Atlantic Reference Center scientists train students, technicians and researchers on the identification and curation of aquatic organisms, and offer a course on the analysis of biological diversity and community structure. Three New Brunswick winners received their awards at a ceremony in their home province. Byron James, left, Susan Snow-Cotter award winner stands beside the Hon. Rick Miles, Minister of the New Brunswick Dept. of Environment. 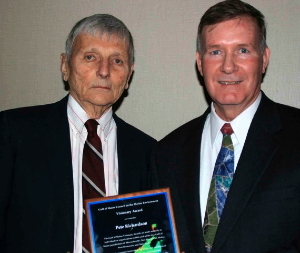 Lou Van Guelpen, Curator of Fishes and Collections Manager, who accepted the Visionary Award for the Atlantic Reference Center, stands beside visionary Peter Etheridge. 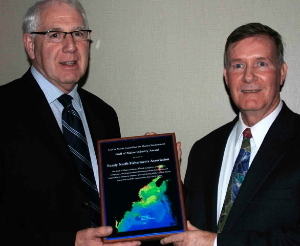 Peter Etheridge also received his Visionary Award on December 15 in Fredericton. Etheridge has been involved in the field of conservation and sustainability for more than 20 years. He worked tirelessly as coordinator of the Fundy Model Forest from 1997 to 2002, lending his support and guidance to the many associates and technical committees of the Fundy Model Forest. Beginning in 2002, he worked to build a support framework and engage stakeholders toward the establishment of the Fundy Biosphere Reserve, and was greatly responsible for the final establishment of the Reserve under UNESCO on September 21, 2007. 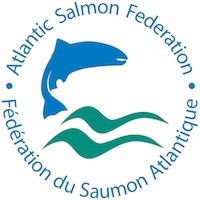 Designation by UNESCO provides not only international recognition for the uniqueness of the upper Bay of Fundy and its culture and history, but in addition emphasizes the importance of conservation and sustainability in the region. Peter has also volunteered in many capacities, including as Volunteer Advisor with Canadian Executive Services Organization (working with aboriginal groups), on the Steering Committee of the Bay of Fundy Environmental Partnership, on the Steering Committee of New Brunswick Protected Areas, as Chair of the Caledonia Gorge Protected Natural Area, and with the Canadian Institute of Forestry. The Maritime Fishermen’s Union of Nova Scotia were presented with a visionary award at a ceremony in their province. The Union is taking a proactive approach to the health of the environment that feeds their livelihood: the sea. The organization established a Clean Oceans Committee in 2007, which works with commercial fishermen, harbor authorities, government agencies, and NGOs across the three Maritime Provinces to raise awareness and change behaviors related to marine debris. The Maritime Fishermen’s Union has led a major media campaign to raise awareness about the impact of marine debris on the health of the ocean and commercial fishing. The organization has been working through its local chapters to ensure that proper recycling and disposal facilities are in place across the region, including the Gulf of Maine. Dr. Danika van Proosdij was presented with her Visionary Award in Nova Scotia, also. A coastal geomorphologist with more than 17 years’ experience studying and conducting research in coastal environments ranging from coastal sand dunes and beaches on the Atlantic coast to salt marshes in the Bay of Fundy and mangroves in Mexico, van Proosdij’s research is primarily field-based with a strong geomatics and environmental focus funded primarily through the Natural Sciences and Engineering Research Council. An active member of the Bay of Fundy Ecosystem Partnership’s Salt Marsh and Restricted Tidal Systems Working Group, she provides research expertise to various environmental NGOs interested in salt marsh ecology and restoration, works closely with the NS Department of Agriculture and the Nova Scotia Department of Transportation and Infrastructure Renewal advocating the use of environmentally sustainable coastal engineering protection works to mitigate the effects of climate change, particularly sea level rise and the potential impacts and implications for the agricultural dykelands and coastal infrastructure in the Bay of Fundy. Van Proosdij is the coordinator of the Maritime Provinces Spatial Analysis Research Center and was instrumental in its establishment. Maritime Provinces Spatial Analysis Research Center is dedicated to using geomatics technologies to address environmental and management issues and is heavily utilized by academics, NGO & community groups and industry involved in coastal management and research. Her courses in the Geography Department at Saint Mary’s University always have a strong focus on the Bay of Fundy. She has been actively studying salt marsh ecosystems in the Bay of Fundy for the last thirteen years and has played an active role in the development and modifications of salt marsh restoration protocols and restoration activities in the region since 2001. She is one of the lead researchers studying the impacts of the Avon River Causeway in Hants County, Nova Scotia, and the development of the extensive mudflat and salt marsh system that has formed downstream of the tidal barrier. Van Proosdij and her students work closely with CB Wetlands & Environmental Specialists to examine the vegetative, sedimentary, nekton and hydrologic conditions pre- and post-restoration at sites across the province both on the Fundy and Atlantic coasts. Most notably, the Cheverie Creek Tidal River and Salt Marsh Restoration Project in Hants County, Nova Scotia, the first project of its type in the province. In 2008, Dr. van Proosdij was awarded a Canadian Foundation for Innovation grant to develop the Intertidal Coastal Sediment Transport Research Unit at Saint Mary’s University. This $337,119 facility contains innovative, state of the art instrumentation to measure sediment transport and sedimentary process in intertidal ecosystems in the field supported by a comprehensive sedimentological lab. These instruments will be used to study salt marsh sedimentary and hydrodynamic processes within natural and restored marshes within the region. Sally Soule, New Hampshire Department of Environmental Services (NHDES) presented a Visionary Award to Pete Richardson, who volunteers for Great Bay Coast Watch as a water quality sampler on the Squamscott River in the town of Exeter. He is on the University of New Hampshire (UNH) Docent Watershed and Plate Tectonics Team and participates in UNH’s Discovery Cruises and Floating Lab programs where he teaches marine biology to adults and youth. Richardson also serves on the Exeter River Local Advisory Committee and is Chairman of Exeter’s Conservation Commission. He volunteers for the NH Department of Environmental Services Volunteer River Assessment Program and Volunteer Biological Assessment Program. Jody Connor, a longtime employee of the New Hampshire Department of Environmental Services, was presented with his Visionary Award by three people: Stephen Landry of the NHDES, Andrea LaMoreaux of New Hampshire Lakes and Joseph Farrelly, a longtime volunteer. Connor’s award closely resembled a lifetime achievement award, acknowledging his service to NHDES starting in 1979. “Connor has dedicated his life to the protection and restoration of surface waters in New Hampshire, creating programs at the NHDES that continue to protect the state’s lakes and ponds from the impacts of cultural eutrophication, invasive species, and toxic pollutants. His efforts have empowered lake and watershed residents to become actively involved and educated in surface water protection,” said Landry. Was instrumental in saving Kezar Lake in North Sutton when it experienced severe cyanobacteria blooms in the 1980’s. After external pollution sources were alleviated, Jody focused upon control of the internal source of phosphorus in the lake by applying an alum treatment to sediments. Kezar Lake has not experienced a cyanobacteria bloom since 1982. The Longard Gulf Volunteer Award is bestowed each year in memory of Art Longard, a founding member of the Gulf of Maine Council on the Marine Environment and long-time Working Group member. 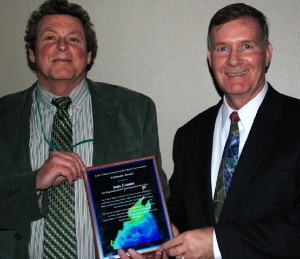 The award is given to an individual from one of the five states and provinces bordering the Gulf of Maine and recognizes individual commitment to volunteer programs dedicated to environmental protection and sustainability of natural resources within the marine, near shore, and watershed environments of the Gulf of Maine. 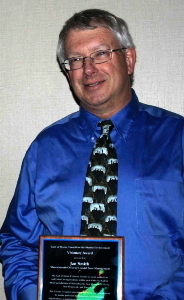 The 2009 Longard Award was presented to Stephen Gale Perrin of Maine. For decades, and we suspect most of his 70 plus years, Steve Perrin has given voice and meaning to the wonder of the Gulf of Maine ecosystem. Often standing alone in his positions (until most everyone else catches-up! ), he has worked selflessly, tirelessly, and continuously as a volunteer in the service of furthering a conservation ethic for the Gulf of Maine and a sound scientific understanding on which to base rational policy and management. A devoted and accomplished teacher, photographer, and writer of uncommon eloquence, Steve’s educational efforts successfully integrate scientific knowledge with subtler insights that can be obtained only through a lifetime marked by curiosity, keen observation, and a sense of wonder. How many people can claim they have chronicled the passing of a year, isolated in a log cabin on an 80-acre island, with the sole intent of experiencing nature unhindered by modern encumbrances and sharing these experiences freely with the public? Perrin’s volunteer activities include being a founding member, past president, and perpetual field data collector for the Friends of Taunton Bay and other organizations. Perhaps most notable, he was instrumental in the monumental task of shepherding Friends of Taunton Bay from a small group of concerned citizens to an influential coastal entity now involved in developing ecosystem-based, community-guided coastal resource-use strategies that have no precedent in Maine, or likely anywhere else in the Gulf. Longard consistently demonstrates unflagging determination, a profound sense of equity, and the ability to identify the ecological and ethical common ground shared by even opposing stakeholders. These traits are most currently evidenced in his volunteer role as Advisor to the Commissioner of the Department of Marine Resources on the Taunton Bay Resource Management Plan, which seeks to accommodate the needs of commercial harvesters and other resource users within the larger context of supporting ecosystem integrity. In 2009, the Susan Snow-Cotter Leadership Award was presented to Byron James, now the Deputy Minister of Post-Secondary Education, Training, and Labour has served in dual role of Deputy Minister for Agriculture and Aquaculture and Deputy Minister for Fisheries and was Deputy Minister of Agriculture, Fisheries, and Aquaculture. He has also served as Deputy Minister for the Department of Environment and Local Government for Municipalities and Housing. He has served in a number of capacities between 1987 and 1998, including Assistant Secretary, Cabinet Committee on Policy and Priorities, Assistant Deputy Minister with Advanced Education and Training and Assistant Deputy Minister, Department of Education. Byron was an active Gulf of Maine Council member during his years as Deputy Minister of Environment and Local Government, Fisheries and Agriculture and Aquaculture. Byron was a key champion for the provincial involvement in the Council and often led workshops and meetings of the council and actively promoted the council’s goals and action plans in his work throughout provincial departments. With Mr. James’s support and leadership, the New Brunswick Coastal Areas Protection Policy was developed. 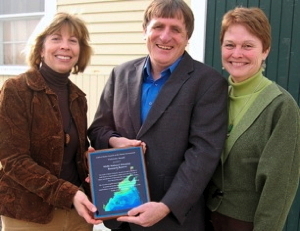 He was instrumental in the development of the first joint federal provincial marine resources planning initiative in the Bay of Fundy focused on developing an ecosystem approach to management by the stakeholders for stakeholders consistent with the overarching principles of the Gulf of Maine Council. Byron was a champion for engaging industry in council activities and helped champion the Council’s Sustainable Maritime Activities Action Plan goal. Byron strongly supported involving industry and resource users with the Council’s activities. Byron has been an excellent mentor to his staff and colleagues, his guidance and encouragement has inspired many. Byron is well respected and admired by former employees. The Susan Snow-Cotter Leadership Award is bestowed in memory of Susan Snow-Cotter, a long-time friend of the Council and Working Group. The award is given to an individual from one of the five states and provinces bordering the Gulf of Maine and honors those coastal management professionals who exemplify outstanding leadership or exceptional mentoring in the Gulf of Maine watershed. As former Director of the Massachusetts Office of Coastal Zone Management, Snow-Cotter was recognized as a leader who exhibited unwavering passion, enthusiasm, and insight to develop pragmatic approaches to coastal management challenges. Serving as a strong and supportive mentor to emerging coastal management professionals. The new Gulf of Maine Industry Award is an annual award made to an individual, company, or organization within the Gulf of Maine region: Massachusetts, New Hampshire, Maine, New Brunswick, and Nova Scotia. The award recognizes demonstrated innovation and leadership in efforts to improve the well-being of the Gulf of Maine ecosystem and the communities that call it home. Nominations were sought from tourism, commercial and recreational fisheries, aquaculture, renewable energy generation and transportation sectors. The first Industry Award was presented to the Fundy North Fishermen’s Association, which has been working for many years to address the problem of ghost fishing in Saint John (New Brunswick) Harbour. There are high gear loss rates in the Saint John Harbour lobster fishery due to the high volume of commercial ship traffic. The Saint John Fishermen are very concerned about the effect ghost fishing is having on the lobster population. To address this, they initiated a project to retrieve these ghost traps. The project is funded through the federal Department of Fisheries and Oceans (DFO) HADD program as compensation for a development project. To date, fishermen have retrieved 371 ghost traps using grapnels of their own design. More than one-third of the ghost traps contained lobsters and crabs. The program will continue through this year. When the project is finished, the fishermen plan to find another funding source to cover the costs of the project. Fishermen are convinced that ghost traps hurt their livelihoods and they are committed to finding a solution to the problem. They are spearheading work on a long-term gear loss prevention strategy for Saint John Harbour with government and industry, but in the meantime, they plan to haul up as many ghost traps as they can find. In the course of this project, the fishermen realized that some fishermen are not using proper ghost panels on their traps. Some were found to be too small or attached with stainless steel instead of biodegradable hog rings. As a result, Fundy North has launched an awareness campaign aimed at fishermen through newsletters and peer pressure. Their goal is for 100% compliance with the ghost panel regulation. Click here to learn more about the GOMC awards.